Launching in 2006, SHO London is a contemporary jewellery label by British-based designer Sarah Ho. Contrasting textures such as woven silk and leather with gold plate motifs and beads, SHO London bracelets are utterly distinct. Featuring colourful friendship bracelets, statement bangles and wrap bracelets, this edit possesses finesse whether layered up or worn as a standalone piece. 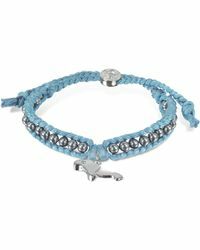 Brimming with heartfelt touches such as characterful charms, SHO London bracelets offer a gift that is sure to be well received.